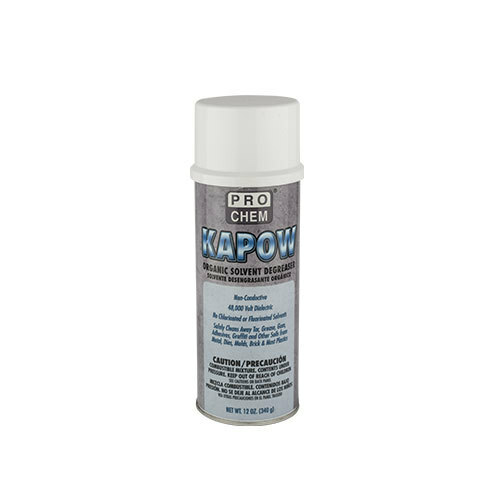 KAPOW | Pro Chem, Inc.
KAPOW is a concentrated formula that contains no chlorinated or fluorinated solvents. The product is designed to provide a safer way to clean grease, tar, oil and grime from electrical and mechanical equipment. This makes KAPOW the ideal product to use in environmentally conscious situations or where highly toxic products are not suitable. The organic solvent degreaser is authorized by the USDA for use in federally inspected meat and poultry plants. Remove cap. Spray over the surface to be cleaned until completely saturated. Allow solvent to penetrate and soften soil. Wipe or rinse with a second spray. On heavily encrusted areas, use a brush. When cleaning electrical equipment, make sure equipment is off. This product may harm some plastics and painted surfaces. Test product in an inconspicuous area before using. Caution: Do not spray on operating equipment that may spark or that has open flame. Avoid prolonged skin contact. Do not store or dispose of near flames, sparks or where temperatures may exceed 120°F. Containers heated above 120°F may burst. Do not puncture or incinerate. Keep out of reach of children. Contains: (CAS#): Isoparaffinic Hydrocarbon (64742-47-8), 1,8-p-Menthadiene (5986-27-5), Propane (74-98-6), Carbon Dioxide (124-38-9).